Brandl's ART Articles: Mark Staff Brandl --- Weltuntergang? Nein, Kunst! End of the World? No, it's Art. Mark Staff Brandl --- Weltuntergang? Nein, Kunst! End of the World? No, it's Art. 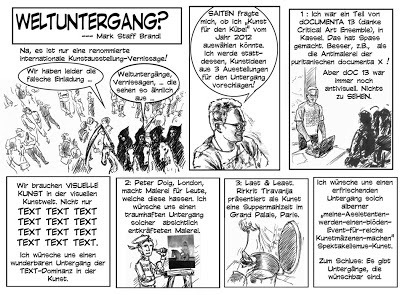 Mein Aufsatz in Comic/sequenzieller Kunst-Form. Für Saiten, Kultur Zeitschrift St. Gallen, Schweiz. 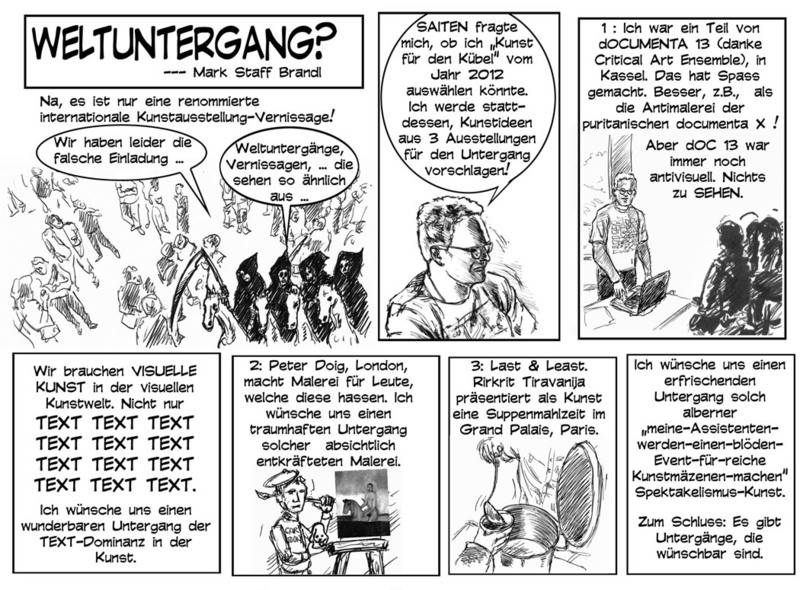 My Essay in comic form for the cultural magazine Saiten, St.Gallen, Switzerland. Dezember 2012. End of the World? Nah, it's only a renowned international art exhibition! SAITEN asked me if I could talk about 3 "Art Shows that Should be Thrown Away" from the year 2012 (for their End of the World December issue). Instead, I will suggest art ideas from 3 shows for this. 1. I was a part of dOCUMENTA 13 (thanks to Critical Art Ensemble), in Kassel germany. It was fun, much better, e.g., than the anti-painting, puritanical documenta X. However, dOC 13 was still anti-visual. Nothing to SEE! TEXT TEXT TEXT TEXT TEXT TEXT TEXT TEXT TEXT. I wish for a wonderful apocalypse of the TEXT-dominance of art. 2.Peter Doig, London., makes painting for people who hate this discipline. I wish for a fantastic apocalypse of such pureposefully feeble painting. 3. Last & least. Rirkrit Tirivanija presented as art a soup dinner in the Grand Palais, Paris. I wish for a refreshing apocalypse of such silly "my-assistants-will-make-a-stupid-event-for-the-rich-art-patrons-Spectaclism" art. In conclusion: there are some apocalypses that are desirable.